Almarcegui highlights neglected or undefined spaces within urban environments, which she researches, preserves, and documents through photos, text, guides and publications. She identified 1 hectare which was a neglected plot of land situated between two highways in Genk. Accompanied by a local nature guide, she carefully scouted, surveyed and described the land. 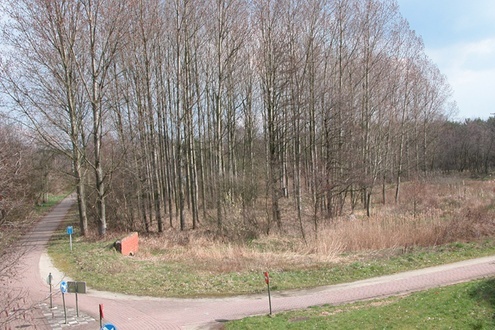 Through negotiations with the City of Genk, Almarcegui then arranged to protect the terrain from development for a period of ten years, preserving the wasteland in its untouched state and allowing nature to take its own course, subject only to the forces and the temporality of wind, rain, sun, vegetation, spontaneous use and litter. The area will remain open to the public, even as most of the adjacent plots are built upon, standing as a memory inscribed on the landscape.